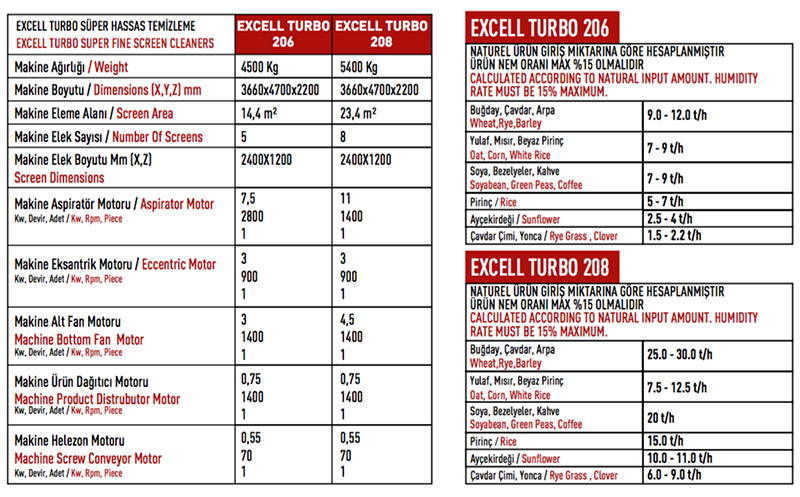 Excell Turbo 208 is a fine-screen cleaner machine. There are double air suction system before the product is spreaded on the screens, so that, screening efficiency is highly increased. In addition, Excell Turbo Series have double air-cleaning channels for underscreen and overscreen product at the same time. Air-flow is can be adjusted by linear electric actuators which are controlled by programmable logic control (PLC) unit. Excell Turbo Series are manufactured to provide excellent cleaning on dried nuts and fruits.Characteristic of Excell Turbo 208 is to clean the products which are very hard to clean such as sesame seed and flax seed. While the other members of Excell Cleaners series have only once dust suction and once gravity separation process, Excell Turbo Series have twice suction and gravity separation.